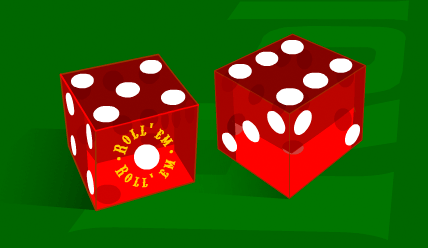 Roll Em is a very simple dice game that involves wagering on the total of two thrown dice. That’s it. Seriously, that’s all there is to it. 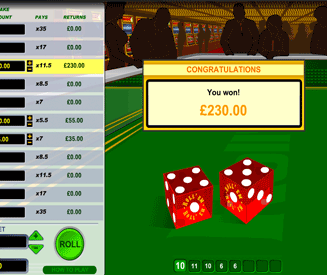 Two standard dice are thrown and you have to guess which number between 2 and 12 will be rolled. No bonus rounds, no cool features and not even a smidgen of anything interesting. In fact, calling this game "basic" actually makes it sound more exciting than it is. If raw, basic gambling is your thing, you’ll love Roll Em. For all those of you that value entertainment, you’ll find Roll Em to be one of the least interesting games that you hope you will never have to play. Note: If you want to play a dice game that’s actually fun, try Dice Wars or Shut The Box. Game fun rating - 12%. "Roll Em" is the kind of game that your least imaginative friend would suggest you play to pass the time, but you obviously just flat out refuse because of how incredibly boring it sounds. Honestly, Roll Em is barely a step up from "heads or tails". If you get drunk or something and decide to actually play the Roll Em game for money, you will confirm your suspicions that wagering on the outcome of dice (and nothing else) is about as fun as watching paint dry in humid conditions. I know for a fact some people will like a game like this, but I also know for an even bigger and meaner fact that a lot more will hate it with a passion. One to avoid in most cases. Wager on a number between 2 and 12. Roll the dice and hope that your number comes in. Don’t forget to laugh at the audio of the dice rolling across the table. It sounds suspiciously like thunder. I know, you could have made a more adventurous game in the morning of an almighty hangover. Roll 'Em in more detail. Note: For what it’s worth, I think it’s a crime to have the game "Roll Em" and the words "...in more detail" in the same sentence. You can wager on any number between 2 and 12. Two dice will then be rolled and the total will be calculated. You obviously can’t wager on the number "1" because the lowest number you can get from two dice is 2 (1 on one dice and 1 on the other = 2). You should already know this from all those hours playing Monopoly. If you wagered on the correct result, you win money. If you didn’t you don’t win anything. It’s so basic it’s almost brutal. Oh, and for good measure you can’t roll over any of your winnings. It’s just one game and done. Rolling a 12 is one of the most unlikely outcomes because there is only one way to make a 12 → 6 + 6. Rolling a 7 is the most likely outcome because there are multiple ways to make a total of 7 with two dice → 3 + 4, 5 + 2 and 6 + 1. Basically, the closer the number is to the "middle" of 2 and 12 (i.e. 7) the lower the payout will be. The further out toward the extremes it is (i.e. 2 or 12) the higher the payout will be. 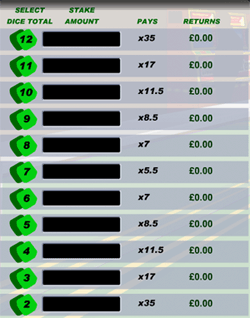 So anyway, here’s the payout table for each individual number in the Roll Em online real money game. If you’re feeling fruity (which you’re probably not because you decided to play this game), you can wager on more than one number in a single game.